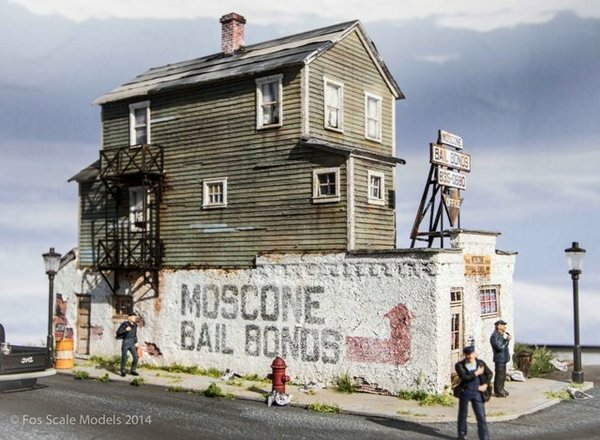 HO-SCALE MOSCONE BAILBONDS - Moscone Bail Bonds is a small Main Street type structure suitable for any era, either in a rural town or gritty city. Much of the character in this kit comes from the rough and weathered first floor stucco finish. In the kit instructions you are shown how to recreate this peeled paint and crumbling stucco look. The kit includes laser-cut clapboard walls, laser-cut matboard walls with scribed brick patches, Tichy and laser cut doors and windows, plastic and metal detail parts, wall lettering stencil, laser cut firescapes, stucco powder( Durham's Putty) color signage and a laser cut sidewalk / foundation section. Approx. footprint 3" x 7.25".